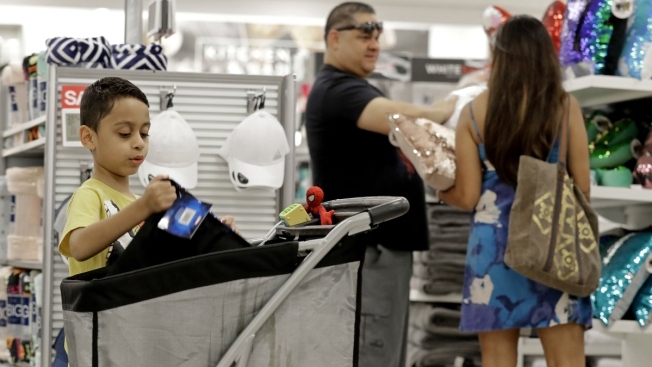 In this Tuesday, Aug. 28, 2018, photo Mark Vega, 7, left, looks inside his family's cart as parents Frankie Vega, center, and Kimberly Vega, right, shop at a Kohl's store in Concord, N.C. Many kinds of chains have posted strong sales, both online and at stores. A booming economy, which has shoppers spending more freely, and companies' own efforts in trying to Amazon-proof their business is driving people’s mood to spend.